WASHINGTON, April 8, 2011 /PRNewswire-USNewswire/ -- In a stunning development Thursday, 14,315 votes in Tuesday's election for Wisconsin Supreme Court Justice were added to the vote total for Waukesha County, the largest Republican-dominated county in Wisconsin, netting 7,582 additional votes for incumbent Justice David Prosser. The additional votes give Prosser the victory in the heated race for the high court. As of Tuesday, challenger JoAnne Kloppenburg had been ahead in the race, according to totals compiled by the Associated Press. These new votes will reverse the election result and add new financial burdens for any recount. ProtectOurElections.org now calls for an immediate Department of Justice investigation and impoundment of all voting machines, computer equipment, ballots, memory cards and other evidence in order to verify a fair vote count in Waukesha County. This investigation must include a review of all communications including emails and telephone records between Waukesha County Clerk Kathy Nickolaus, others in the Waukesha clerk's office, and all outside persons and interested parties to the election dispute. "Waukesha County Clerk Kathy Nickolaus is a partisan activist who has a long history of election irregularities and questionable conduct," said Protect Our Elections spokesman and attorney Kevin Zeese. "She was given immunity from prosecution in a 2002 criminal investigation into illegal activity by members of the Republican Assembly caucus where she worked as a data analyst and computer specialist. Last year, it was discovered that she unplugged election results from the State system and instead stored them only on her personal computer, and then resisted an audit which found such conduct in violation of accepted practices. She was also taken to task for keeping election results secret from others, refusing to follow security protocols, and for letting her 'Republican activism' interfere with her job. And now, it appears that she intentionally held back these new vote totals from other officials and observers but leaked the data to conservative bloggers to break the story. Finally, it is being reported that she previously worked with and was hired by Judge Prosser. Based on these shocking developments and to ensure the fairness of the election results, the Department of Justice must immediately step in and conduct at a full, impartial, and independent investigation into this matter directed by its Civil Rights Voting Section. " ProtectOurElections.org has for years been advocating for secure elections, and questioning the validity and vulnerability of results from electronic voting machines and electronic vote-counting systems, because these results can easily be altered without leaving a trace of evidence. On Feb. 8th 2008, US Attorney Christopher J. Christie submitted a letter to the court in the matter of the United States vs Wayne Bryant. In the letter USA Christie attacks the Political Profiling study that is being done by Donald Shields, Ph.D., stating the study is "deeply flawed and inherently unreliable". This is the response from Dr. Shields. As he explains the premise of the study and the methodology used, he evicerates USA Christie's arguments. Give it a read, then come back here to discuss. For additional reading, check out 2008 begins with new investigations into Fired U.S. Attorneys by Cho. 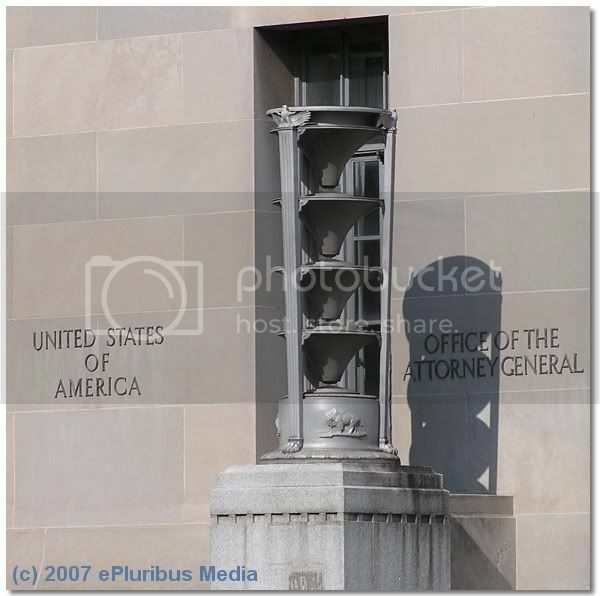 After the flip, a short list of additional coverage by ePluribus Media on the political profiling and politicization of the Department of Justice. Over the past couple of years ePluribus Media researchers and writers have published many stories about the DOJ, including several biographical pieces on the main villans. Watchers of the DOJ drama have been anticipating a report on the hiring practices of the Bush/Gonzales Justice Department. The long-awaited report has finally been released. As you will remember, Mr. Schlozman was the "appointment" to replace Todd Graves as US Attiorney in W. Missouri. This appointment was the ultimate "reward" for his shenanigans that played a major role in politicization of the Department of Justice. While at the DOJ, he actively promoted the Republican's unusual brand of "voter rights" for which he received promotions to positions of greater authority. The Nation has a great piece, Justice, Bush Style, that the rest of the media reporting on ACORN should read. The article will read more like a review for many of us at ePluribus since we devoted a lot of attention to the politicization of the DOJ. But are we hearing anything about the near destruction of the Civil Rights Division from the press who is in a frenzy to cover the alleged voter fraud by ACORN? A startling flurry of inspector general reports--including one released September 29 focusing on the US Attorney firing scandal--along with the testimony of former Justice staffers interviewed at length by The Nation, paint a detailed picture of how a once-proud government department came to teeter on the brink of a nervous breakdown. With the presidential election looming, the consequences of pervasive politicization could be profound, as the department's rules of engagement in the electoral process have been completely remade to allow a much greater degree of direct interference. "They have destroyed the internal culture of the Justice Department as a restraint on the executive branch," said Bruce Fein, a prominent Washington constitutional lawyer who cut his teeth at Justice during the Watergate scandal and later served as a political appointee under Reagan. "There's no professional insistence on treating law and politics separately. It's all one." The author covers the changes that took place from Ashcroft through the unraveling in 2007. So where does this leave the nation as we face the elections of 2008? The Justice Department pledged Monday to send election monitors around the country to help ensure access to the polls in November, even while acknowledging its limited power to enforce election laws. July 17 (Bloomberg) -- UBS AG and Liechtenstein bank LGT Group aided rich U.S. clients who wanted to disguise ownership of accounts and evade taxes on hidden assets, a Senate subcommittee said. UBS, the world's largest wealth manager, hid as much as $17.9 billion for 19,000 Americans who didn't declare assets to the Internal Revenue Service, the Senate Permanent Subcommittee on Investigations said in a report released in Washington late yesterday. LGT, owned by Liechtenstein's ruling family, fostered a ``culture of secrecy and deception'' while assigning code names to U.S. clients, the panel said. Isn't it nice that banks will bend over backwards for the money of rich Americans? Senate investigators got help from former UBS banker Bradley Birkenfeld, 43, who pleaded guilty June 19 to helping California billionaire Igor Olenicoff evade taxes. Birkenfeld said he conspired with Liechtenstein banker Mario Staggl, 43, who was indicted with him on April 10. Anyone with information about the whereabouts of Mr. Staggl should contact the Justice Department, post-haste -- it appears that they are actually taking this case seriously, as opposed to domestic ones that are looking into multiple instances of malfeasance and criminal conduct by the Bush Administration, and therefore might actually use the information wisely. Check out the complete article on Bloomberg (linked at the top of the story). It's an eye-opener. Contested FEC Nominee - Spakovsky Drops Out! Just a quick post for those who have been following Spakovsky. A controversial Bush administration nominee to the Federal Election Commission withdrew from consideration yesterday, providing a likely breakthrough to an impasse that has sidelined the political watchdog agency at the height of the primary season. Hans von Spakovsky, a former Justice Department lawyer whose nomination became entangled in allegations that political considerations influenced decisions by the agency's Civil Rights Division, sent President Bush a letter withdrawing his name. Senate Democrats had refused for a year to confirm von Spakovsky, torpedoing the nominations of three other nominees and denying the FEC a quorum. Since Jan. 1, only two of the agency's six commissioner slots have been filled. Bush, supported by GOP Senate leaders, had refused to withdraw von Spakovsky's name. Read more about Contested FEC Nominee - Spakovsky Drops Out! The morning calm in the small Alabama town of Toney, located near Huntsville, was broken at 6:15 a.m. yesterday morning. A team of five FBI agents, accompanied by a prison matron, pounded on the door. When the man of the house answered, he was forced into the yard, shirtless in the early morning cold. The team had come for his wife, Sue Schmitz. She was dragged out of her bathroom, where she was taking a shower, handcuffed, breaking her flesh and scraping her wrists, and hustled off to prison. .. Who was this threat to the community? Sue Schmitz is a dimuitive, 63-year-old retired social studies teacher who has lived in the town for 38 years, roughly 20 of them as a civics teacher. Read the whole thing, try to remain calm. Civil Rights Division to "Throw Tanner Under the Bus"
ePluribus Media has learned that the leadership of the Department of Justice’s Civil Rights Division has reversed its July decision and is now signaling its willingness to permit Voting Rights Section Chief John Tanner to testify before Rep. John Conyers (D-MI)’s House Judiciary Committee. Although a Judiciary Committee spokesperson has confirmed the reversal, the final date and time for the testimony have not been finalized. There’s speculation that Tanner in his testimony will assume responsibility for the Georgia Voter ID controversy, leaving Hans von Spakovsky, currently up for confirmation to the Federal Elections Commission, a cleaner resume. Read more about Civil Rights Division to "Throw Tanner Under the Bus"